The F-35 Lightning II fifth generation fighter is developed by the United States and eight partner nations. In 2002 The Netherlands joint the program as a Tier 2 (Level 2) partner. Until it received its current designation the aircraft was known as Joint Strike Fighter (JSF). Lockheed Martin head test pilot Jon Beesly made the first with the JSF on December 15, 2006. Taking off from Fort Worth, Texas the aircraft flew for 35 minutes and reaching 15.000 feet. It marked the start of a 12.000 flight hour test program. The Dutch goverment decided to buy two F-35As Lightning II to participate in the operational test and development phase of the Lightning II. In 2009 the contract was signed for the first aircraft followed in 2011 for the second F-35. On October 17, 2018 the Dutch MoD announced to buy the final three aircraft resulting in the planned purchase of 37 aircraft. From LRIP 12 these will be part of a block buy with the F-35 partners. As part of the national NATO plan approved by the government the intention to buy additional F-35A's was announced on December 14, 2018. The decision will be taken in the spring of 2019 when the government will decide how to divide additional budget between all its priorities. Currently two operational squadrons can be fielded with NATO calling for a third squadron which translates to rougly 15 additional Lightnings. The first eight F-35s will be build by Lockheed Martin at its Fort Worth, Texas plant. Two ordered in the early production batches are engaged in the Operational Test and Development (OT&D) program and assigned to 323 TES based at Edwards AFB, California. The other six aircraft (MSN AN-3 until MSN-8) are currently in various stages of production at Fort Worth. Of these AN-3 (F-003) made its first flight on Saturday December 15, 2018. 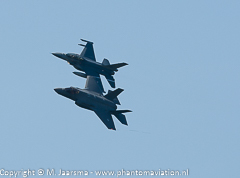 F-003 will be the first aircraft for Nederlands Opleiding Detachement F-35 (NODF-35). The detachment is embedded within the USAF 308th FS / 56th FW at Luke AFB, Arizona and will be responsible for all training on the Lightning II. F-003 will be delivered in week 4 of 2019. By the end of the second quarter all six F-35A's should be delivered to the unit with the two 323 TES aircraft to follow after the OT&D program has been completed. In Italy (Leonardo FACO Cameri) final assembly of AN-9 began on June 15, 2018. It will be delivered to 322 squadron based at Leeuwarden on October 31, 2019. F-35 order and delivery reports (overview of current ordered and delivered aircraft and detailed production batches). F-35 to The Netherlands (May 23 - June 14, 2016). Ordered 10 LRIP: 3, 4, 11. Contract 27 LRIP: 12 - 15. Contract signed, US DoD to award the production contract to Lockheed Martin. Opport. 15 Part of the national NATO plan to increase defence spending. Prod. Batch Production batch (FRP or LRIP). MSN /CN Manufacturer Serial Number. LRIP Low Rate Initial Production. 15-04-19 First flight F-008 to be delivered to NODF-35 (308 FS) Luke AFB, Arizona. Last aircraft of the Fort Worth production line. 19-03-19 F-005 delivered to NODF-35 (308 FS) Luke AFB, Arizona. 12-03-19 F-007 delivered to NODF-35 (308 FS) Luke AFB, Arizona. 06-03-19 F-006 delivered to NODF-35 (308 FS) Luke AFB, Arizona. 20-02-19 First flight F-007 to be delivered to NODF-35 (308 FS) Luke AFB, Arizona. 07-02-19 F-004 delivered to NODF-35 (308 FS) Luke AFB, Arizona. 04-02-19 F-003 delivered to NODF-35 (308 FS) Luke AFB, Arizona. 30-01-19 Official roll-out of F-35A F-003 (first flight on December 15, 2018). 28-01-19 First flight F-006 to be delivered to NODF-35 (308 FS) Luke AFB, Arizona. 23-01-19 First flight F-005 to be delivered to NODF-35 (308 FS) Luke AFB, Arizona. 08-01-19 First flight F-004 to be delivered to NODF-35 (308 FS) Luke AFB, Arizona. 15-12-19 First flight F-003 to be delivered to NODF-35 (308 FS) Luke AFB, Arizona. additional budget will be allocated to extra F-35A's. Minister of Defence Bijleveld referred to about 15 aircraft. to include these aircraft into the production of Lot 15 with delivery in 2023.
one of the 323 TES F-35A's will need to receive new fuel lines. 15-06-18 Start of assembly of the first F-35A build by Leonardo at Camera Italy. 10-06-16 Official presentation to the public at the Luchtmachtdagen (Air Force Days) at Leeuwarden. 07-06-16 F-35A flight over The Netherlands. 26-05-16 Belevingsvluchten (experience flights) for Leeuwarden and Volkel residents. 23-05-16 Arrival of the two F-35As at Leeuwarden Air Base. the Operational Test & Evaluation phase. 18-12-13 The first F-35A (F-001) solo flight by a RNLAF was conducted by Major Laurens Jan Vijge from Eglin AFB, Florida..
10-10-13 The first Dutch pilots started the pilot training program theoratic phase with first flights planned in December. Training commenced to be ready for the operational test and development phase to start in 2015. 25-07-13 First F-35A (AN-1 / F-001) handed over by the US DoD. 06-03-13 Second F-35A (F-002) rolled of the production line at Fort, Worth, Texas. 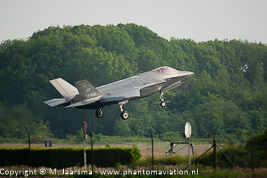 06-08-12 Roll out of the first Dutch F-35A (F-001). 09-02-12 Jet engine installed on the first F-35A (F-001). 14-11-06 Poduction Sustainment & Follow-on Development (PSFD) Memorandum of Understanding (MoU) signed with US. 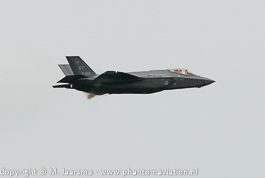 2011 Order for the second (test) RNLAF F-35A. 02-06-09 Order for the first (test) RNLAF F-35A. 29-02-08 Government decided to take part in the Initial Operational Test and Evaluation phase (IOT&E). 2002 Netherlands Tier / Level 2 partner JSF (Joint Strike Fighter Progeam). First visit at Volkel by F-002/OT May 26, 2016. Flyby by F-001/OT at Soesterberg on June 7, 2016. Presentation to the public during its first appearance at an air show. Leeuwarden, luchtmachtdagen 2016.